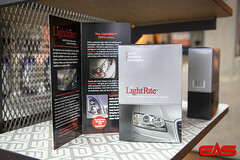 Clouded headlights diffuse and absorb the light that should be illuminating the road. By restoring your headlights to new condition, you will be surprised by how much brighter the road is ahead of you. This equates to better visibility and safer driving. You may not notice your clouded headlights, but you will notice them when they are crystal clear as when the car was new. We use a restoration process that can clear cloudiness from any headlight type whether glass or plastic. Restores plastic headlight covers to factory clarity. Restores glass headlight covers to factory clarity.